10 DESTINATIONS WHERE YOUR DOLLAR GOES FAR! What $20 Will Buy: A Lisboa card provides use of nearly all public transportation and discounts on some tours and admission to museums and monuments. When To Find Deals: September and October, when four-star hotel in central Lisbon generally go for $100 per night and round-trip airfare from Chicago starts at $800.00. What $20 Will Buy: Carmenere, made from a grape originally from the Bordeaux region of France, costs less than $10 a bottle. When To Find Deals: The springlike shoulder-season of October and November, when round-trip flights from Chicago to Santiago start at $1,000 per person. Top Bargains: Luxury hotels. Under Chilean law, foreign tourists do not pay the 19 percent value-added tax for hoptel stays. Why It's Hot: On the water and ringed by green hills, the artsy city is a half-day's travel to two major wine regions -- Hawke's Bay and Marlborough. Months For The Best Deals: In the fall. The weather will be nice, and you'll save on airfare and lodgings. For example, a round-trip flight from Chicago starts from $2,200 in June, but only $1,500 in September. Top Bargains: Wine vacations. Bed-and breakfasts in Hastings cost less than $75 per night. What $20 Will Buy: A meal fit for an emperor at the Phu Xuan restaurant. 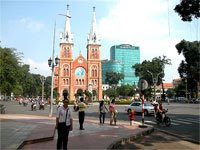 Why It's Hot: It's less touristy than Hanoi, and has a thriving dining and entertainment scene. Take a short day trip to Mui Ne, a resort city near the beach, or to the white sand dunes of Binh Thuan desert. What $20 Will Buy: A boat tour of the city along the Danube river. Why It's Hot: You can enjoy Old Europe charm without paying for it in euros. Top Bargains: Classic culture comes cheap in Budapest. With a Budapest card, you get discounts on museums and restaurants plus unlimited use of public transportation. A two-day card costs $35 and is available at the city's tourism office. Top bargains: Custom-made clothing costs three-fourths less than in major U.S. cities. Tango dance parties also offer free or cheap entertainment. Many are held in the colorful La Boca district, shown here.What $20 will buy: A steak dinner with Argentine wine at a fine restaurant. 20 dollars can probably get you 3 nights on the beach if you know where to look!